As the weather turns autumnal I've started craving some warming comfort food. Fluffy cornedbeef hash, crispy potato skins and a strong melted cheddar cheese all score very highly on my comfort food check list. This combination of all three is perfect for cosy evening indoors. Slice a jacket potato in half. Place it skin side up in an ovenproof dish and sprinkle it with a little oil and a pinch of salt. Bake for 45 minutes. Scoop out the insides of the potato leaving a little flesh around the skin to keep the potato shell intact. 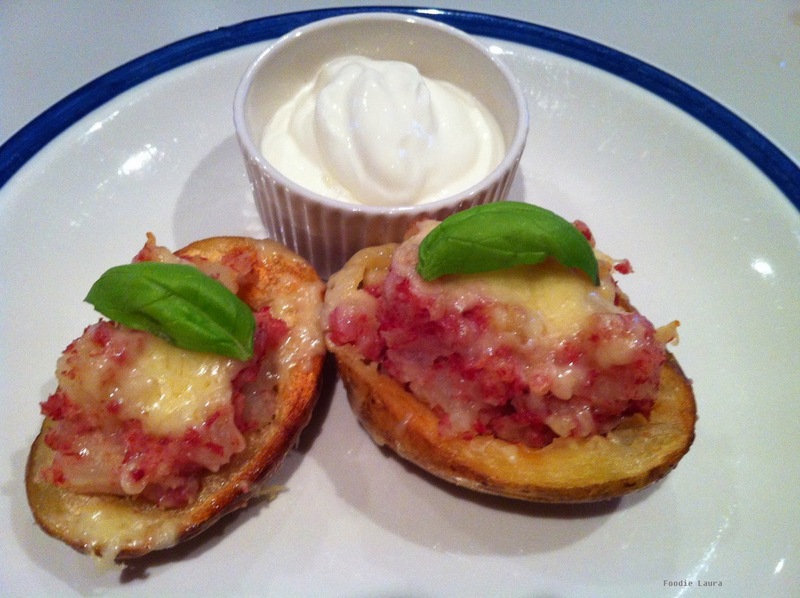 Mix the scooped out potato with a splash of milk and a slice of corned beef. Put the corned beef mix back into the potato skins. Cover with grated cheese and pop back into the oven for the cheese to melt this takes about 5 minutes.